A hernia is defined as the protrusion of part or whole of an organ or tissue through the wall of the cavity that normally contains it. There are numerous types of abdominal hernia, the most common of which are hiatus, inguinal, and femoral hernia. However, there are a number of less common abdominal hernia that require identification and suitable management. An epigastric hernia occurs in the upper midline through the fibres of the linea alba (Fig. 1). They are typically secondary to raised chronic intra-abdominal pressure, such as with obesity, pregnancy, or ascites. They are relatively common with a prevalence up to 10%, mostly affecting middle-aged men. Whilst typically asymptomatic, they may present as a midline mass that disappear when lying on the back. A paraumbilical hernia is a herniation occurring through the linea alba around the umbilical region* (not through the umbilicus itself). They are also typically secondary to raised chronic intra-abdominal pressure and present as a lump around the umbilical region. 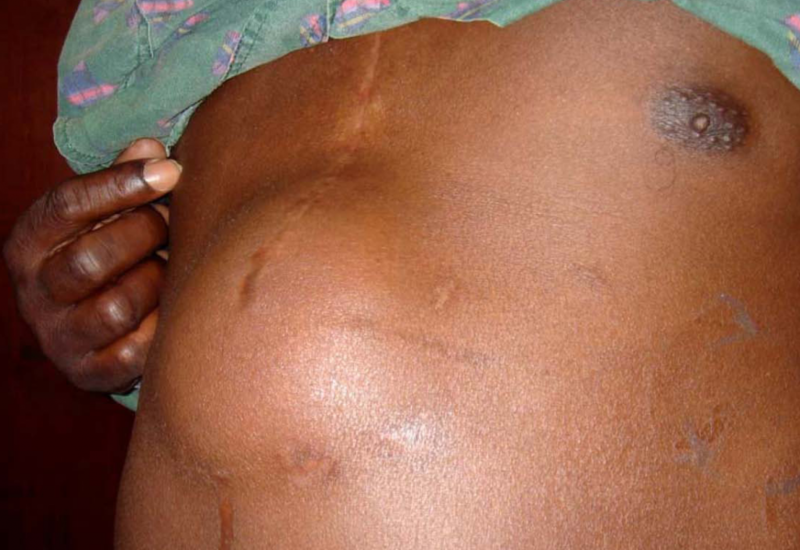 A spigelian hernia is a rare form of abdominal hernia that occurs at the semilunar line (the tendinous lateral border of the rectus, where the aponeuroses fuse), around the level of the arcuate line. Clinically, they present as a small tender mass at the lower lateral edge of the rectus abdominus*. They have a high risk of strangulation, and so should be repaired urgently. *One study has shown cryptorchidism is also present in 75% of cases of Spigelian hernia in male infants, likely associated with a failure in gubernaculum development. An obturator hernia is a hernia of the pelvic floor, occurring through the obturator foramen, into the obturator canal (Fig. 3). They are more common in women (due to a wider pelvis), typically in elderly patients*. Patients will classically present with a mass in the upper medial thigh and often patients will have features of small bowel obstruction. *Due to the substantial amount of fat that is contained within the obturator canal, many obturator hernias also present in those who have undergone rapid weight loss. Losing the fat located in the canal results in a larger space for potential herniation to develop. A Littre’s hernia is a very rare form of abdominal hernia, whereby there is herniation of a Meckel’s diverticulum. This most commonly occurs in the inguinal canal and many will become strangulated. Lumbar hernias are rare posterior hernias, that typically occur spontaneously* or iatrogenically following surgery (classically following open renal surgery). They present as a posterior mass, often with associated back pain. A Richter’s hernia is a partial herniation of bowel, whereby the anti-mesenteric border becomes strangulated, therefore only part of the lumen of the bowel is within the hernial sac. Patients will present with a tender irreducible mass at the herniating orifice and will have varying levels of obstruction (purely dependent on how much bowel circumference is involved). Due to obstruction, these are often surgical emergencies that need urgent surgical intervention. Care must be taken during hernia repair to identify a Richter’s Hernia so as to not damage the bowel during the surgery. Which of the following hernia types describes herniation of a Meckle's diverticulum? Which statement about hernias is false? Which of the following is NOT a known risk factor for developing a ventral hernia? In cases of strangulated hernia diagnosis, what is the recommended next step in management?